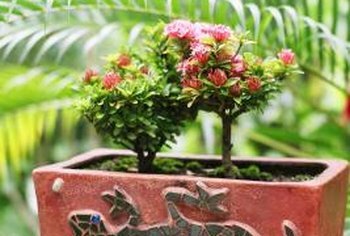 Adding miniature roses to your landscape project is worthwhile, but it takes some know-how to keep the pretty, petite blossoms looking perky. Plant the miniature roses outside. If you choose to put the roses in an interior mini-landscape, you’ll enjoy the fragrant beauties for a brief time. Miniature roses only bloom for a week or more inside. They need outside lighting for healthy growth, unless you have a greenhouse. Although, they thrive in any soil, don’t let the soil get completely dry. The small plants have small roots. As such, miniature roses need more water. Water often and fertilize in twice as much, but in smaller amounts. According to the National Gardening Association, miniature roses need lesser amounts of fertilizer than regular roses. The plants are tough and they will weather a harsh winter with the rest of the plant family, ready to bloom in the spring. However, they’ll suffer less damage, if you place mulch at the plant base to protect during the winter. This is especially necessary in extreme cold. There’s no need to prune in the fall. You’ll only need to cut dead heads in the spring to keep your mini-roses looking spectacular. Shedding blooms, roses rejuvenate. Miniature roses, like the full-sized counterparts, have vibrant colors and often smell of sweet fragrance. Now that you’ve got the care information, remember that mini-roses can offer a dramatic difference to your landscape, depending on the type that you choose, between compact and cascading. Miniature roses are bright and attractive. These plants work well in a container and they are great companions for annuals or perennials. They bloom early, so place the roses 12-to-18 inches apart. They are perfect as a border, as the exploding colors of the mini-roses will uplift and accentuate your miniature garden design.